MANILA, Philippines – Korean TV station KBS has admitted to canceling the scheduled TV appearance of boy band JYJ to promote Jeju Island because of the latter’s ongoing lawsuit against SM Entertainment. 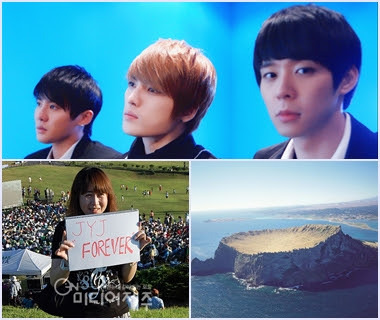 JYJ, the honorary ambassadors of Jeju Island, were supposed to perform in a TV special on July 20 to strengthen Jeju Island’s bid to be named one of the New 7 Wonders of Nature. However, KBS canceled their appearance and replaced them with SM Entertainment artists Girls Generation and f(x). A report on Hankooki.com quoted a KBS official as saying that unless a final resolution concerning the JYJ-SM Entertainment case is decided, the boy band will continue having a hard time appearing on KBS shows. Fans criticized KBS and the Jeju provincial government for cancelling JYJ’s performance, airing their disappointment on Twitter, Facebook and other online forums. Jeju Island is one of the 28 finalists in the New 7 Wonders of Nature global poll along with the Philippine's Puerto Princesa Underground River. Following this, the provincial government of Jeju already issued an apology to JYJ fans. “The provincial government is sorry about the cancellation of JYJ’s appearance in the KBS concert ‘Go! N7W! Here is Jeju’ at Seongsan Sunrise Peak on July 20. When we hold a big event in the future, we will positively support JYJ’s appearance, an honorary ambassador which has been playing a major role in the [N7W] campaign,” it said in a statement as quoted in the Jeju Weekly newspaper. The New 7 Wonders of Nature official website took notice of the JYJ-KBS issue. JYJ fans from across the world have issued a statement condemning KBS for its action. “We hereby condemn the actions of the Korea Broadcasting Systems (hereafter 'KBS') for its deplorable breaking of public trust with regards to the unjustified cancellation of JYJ’s public television appearance in connection with the New 7 Wonders of the Natural World promotional campaign for Jeju Island,” said the statement as endorsed by JYJ fans in the Philippines, Indonesia, Spain, Finland, Peru, US, Mexico, Taiwan, Venezuela, Turkey and other countries. “However, the greatest damage perpetrated by KBS has been on the international image of Korea and against the people of Jeju Island. Due to the failure of the relevant South Korean authorities to reform the status quo of the Korean pop cultural contents industry, Korean and international citizens alike are witnessing an intolerable scenario: the betrayal on the part of a nationally-owned media institution against its own people, nation and public for the sake of corrupt, private interests,” it added.